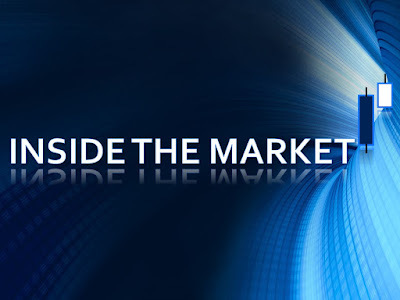 Inside The Market: "Average down" strategy : a path to disaster. "Average down" strategy : a path to disaster. The strategy describes the process of buying additional shares at lower prices compared to the original purchase price. The aim is the following : it brings the average price that we've paid for all the shares down. It can be a discount but just apparently. In this way, in my opinion, that is the only reason that drives the investor to do it. It a somewhat obsolete technique and personally, I should not consider it a strategy. Against this background, it is just a state of mind and a mechanical process, without logic. At the end of the process, the investor obtained the following result : his portfolio is composed by a huge amount of shares of the same asset and if he reduced the loss (due to the lower average purchase price), on the other, his recovery rate (it means the percentage upside required to get the feed capital) is always higher in absolute terms than the current loss. This is especially true the more the final purchase price is lower than the original purchase price. In other words, the more the stock performance worsened. The following table explains the situation. We are assuming that the trend is bearish, of course. There are neither broker commissions nor financial fees, for simplicity. Then, the multiple purchases are of a same amount. With the multiple purchases, we bring the average price down, compared to the initial price and with regard to the situation without subsequent purchases. However, we can notice that the recovery rate is always higher than the loss percentage (in absolute value). Obviously, the gap is higher without subsequent purchases. Nevertheless, it is reductive to focus on it : we should necessarily consider the higher exposure and risk. Then, with a proper investment plan, we should have cutted the losses and the purchase price at 0,50 EUR would have never exist (and the same for the lower prices). With the respect of the stop loss and of the target price, we really reduce the risk and we really build a proper trading strategy. The chart below shows what I said. Gain/loss % is better than Stock performance (equal to the gain/loss % without multiple purchases). 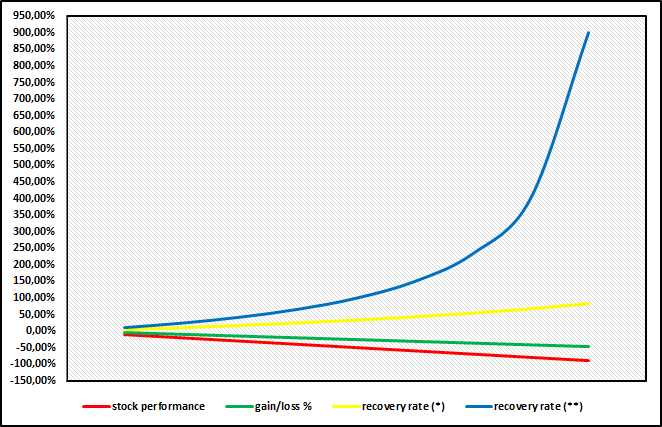 Recovery rate (**) > Recovery rate (*). 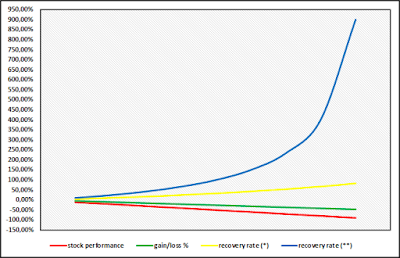 Recovery rate (**) > ABS (Stock performance) and Recovery rate (*) > ABS (Gain/loss %). Finally, I don't recommend the "average down" for the reasons above (apart from some exceptions, like change of trend or with other reversal signals). Instead, I highly recommend the respect of the risk management, of the SL&TP and in general of a suitable trading/investment plan.